The first official photo of Jodie Whittaker as she will appear in Doctor Who has been released.She is seen in teal cropped culottes with yellow braces, as well as a striped jumper and long trench coat.The Broadchurch and Trust Me star has begun filming as the 13th Time Lord.Whittaker, the first female Doctor, takes over from Peter Capaldi and will make her debut on screen when the Doctor regenerates in the Christmas special on BBC One. Her look is completed with brown boots, blue and turquoise striped socks and some unusual earrings, at the top and bottom of her left ear. Fans have already started dissecting the look - which also features a rainbow-stripe trim to the pale-coloured coat. And some have already noticed a similarity to costumes worn on another sci-fi programme - Mork and Mindy. And another said they approved of the look as a whole - but wondered where her tie was. Doctor Who without a tie is like Star Trek without jumpsuits or Star Wars without belts. There appear to be references to previous incarnations of the Time Lord in the outfit. The new Doctor isn't the first to wear braces - they were seen, most recently on 11th Doctor Matt Smith. And the stripes on the jumper could be seen as a nod to those on the striped scarf won by Tom Baker's Doctor. It's not gone unnoticed by fans with one saying it "has great elements from previous Doctors". 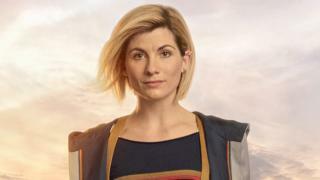 When her casting was announced in July, Whittaker said it felt "overwhelming, as a feminist" to have the role.She told fans not to be "scared" by her gender.She said: "It's more than an honour to play the Doctor. It means remembering everyone I used to be, while stepping forward to embrace everything the Doctor stands for: hope. "In a trailer that was released at the time, Whittaker was seen in a dark hood and long grey coat - but said that wouldn't be part of her official Doctor Who outfit.She will be joined in the cast by Bradley Walsh, Tosin Cole, Mandip Gill and Sharon D Clarke. Follow us on Facebook, on Twitter @BBCNewsEnts, or on Instagram at bbcnewsents. If you have a story suggestion email entertainment.news@bbc.co.uk.